270 Clarendon is located on the SW corner of Clarendon and Marlborough, with 274 Clarendon to the north, across Marlborough, the Clarendon Street Playground to the south, across Alley 424, 92 Marlborough to the east, across Clarendon, and 104 Marlborough to the west. 270 Clarendon was designed by Weston and Rand, architects, and built ca. 1873 as the home of Dr. James Reed Chadwick and his wife, Catherine Maria (Lyman) Chadwick. They previously had lived at 121 Boylston. Dr. Chadwick purchased the land for 270 Clarendon on August 4, 1873, from hardware merchant Albert Fleetford Sise, part of a lot he had purchased from the Commonwealth of Massachusetts on November 8, 1865. Albert Sise and his wife, Edith (Ware) Sise, had lived next door at 104 Marlborough until earlier in 1873, when they moved to Medford. 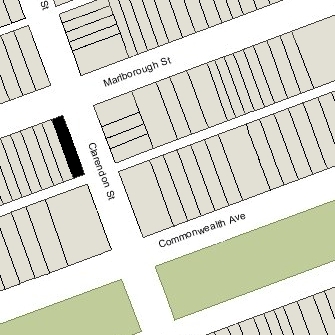 When James Chadwick purchased the; land, the deed included a restriction, established in an agreement on November 9, 1865, between Albert Sise and William Thomas (owner of the land immediately to the west) that prohibited for twenty years the construction of any building of more than eight feet in height in the rear areas of 270 Clarendon and 104-106-108 Marlborough. Click here for an index to the deeds for 270 Clarendon. James Chadwick was a gynecologist and professor of gynecology at Harvard Medical School. In 1873, he established a free dispensary for the treatment of diseases of women. In 1875 he established the Boston Medical Library and served as the librarian from its inception until his death. He was described by Oliver Wendell Holmes as the “untiring, imperturbable, tenacious, impressible, all-subduing agitator, who neither rested nor let others rest until the success of the library project was assured.” An active proponent of cremation, he reorganized the New England Cremation Society, assisted in the building of a model crematory and chapel near Boston, and served as president of the Massachusetts Cremation Society. The Chadwicks moved to the Hotel Guildford at 220 Clarendon for the 1888-1889 winter season and then traveled abroad. 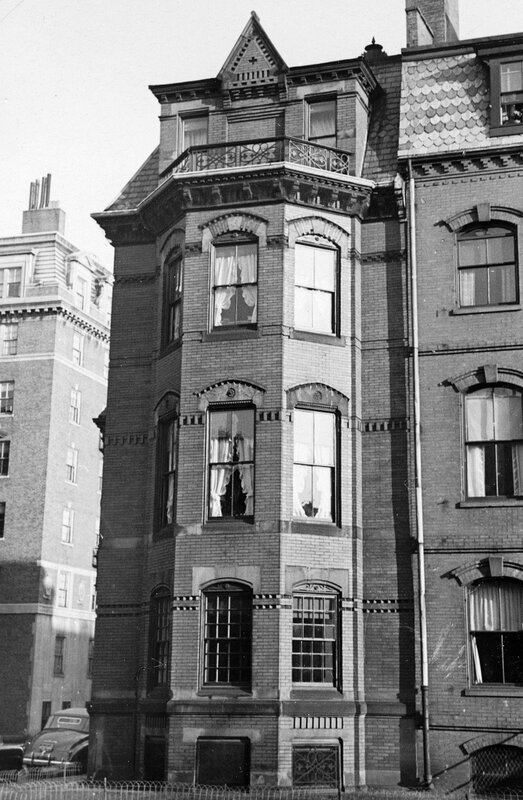 270 Clarendon became the home of Dr. Walter Joseph Otis and his wife, Alice Dexter (Fay) Otis, probably living there upon their return from Europe, where he had been engaged in advanced medical studies. The Otises had moved by the next season, and by the 1891-1892 season were living at 267 Beacon. Catherine Chadwick died in July of 1889 in Birmingham, England. Dr. Chadwick resumed living at 270 Clarendon, where he remained until his death in September of 1905 from a fall from a window at his summer home in Chocorua, New Hampshire. 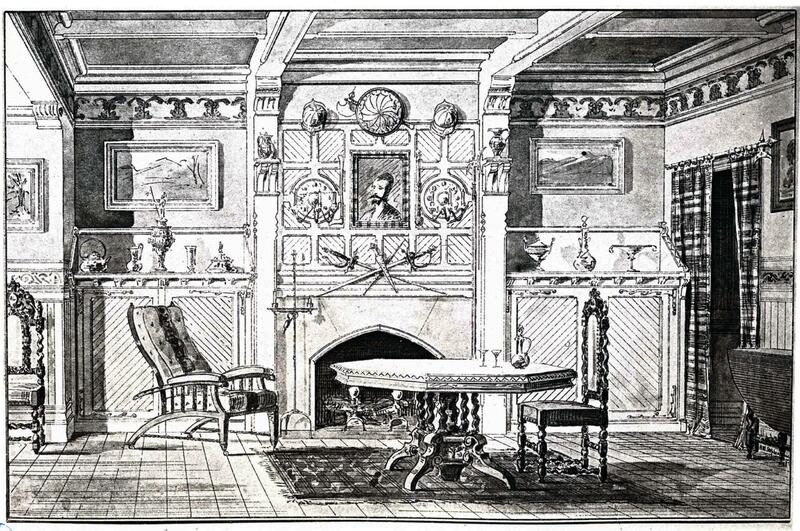 After his death, 270 Clarendon became the home of his daughter, Norah, and her husband, attorney Julian Codman. They continued to lived there in 1906, but had moved to an apartment at 409 Marlborough by 1907. By the 1906-1907 winter season, it was the home of Frank Brewer Bemis and his wife, Marion Wells (Cumings) Bemis. They had lived at 257 Marlborough during the previous season. They also maintained a home at Beverly Farms. Frank Bemis was a banker and also a noted book collector. 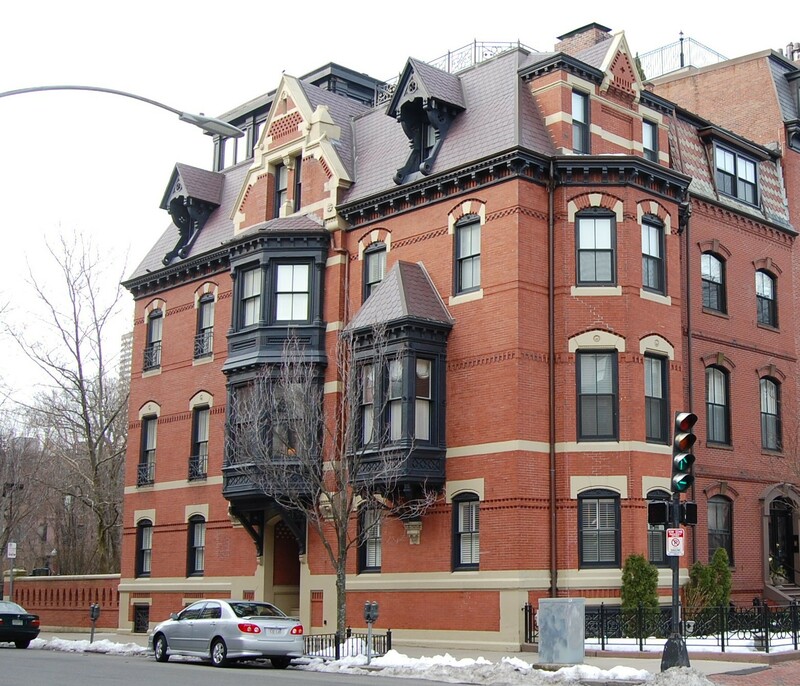 They continued to live at 270 Clarendon until August of 1908, when they purchased and moved to 128 Beacon. On June 1, 1906, 270 Clarendon was purchased from James Chadwick’s heirs by Dr. Maynard Ladd, and on the same day, he transferred it to his wife, Anna Coleman (Watts) Ladd. They lived in an apartment at the Hotel Royal at 295 Beacon until Frank and Marion Bemis moved. The Ladds also maintained a home in Beverly Farms. Maynard Ladd was a pediatrician. Anna Coleman Ladd was a noted sculptor who maintained her studio at the house. Triton Babies, now in the Public Garden, was her work. She also was the author of two novels. In 1917, the Ladds went to France where they served in the American Red Cross. He ran a hospital and she opened the American Red Cross Portrait Studio, where she made “new faces” for disfigured soldiers. These “portrait masks” were made of thin copper and enameled in skin tones to provide a cosmetic screen for those awaiting reconstructive surgery. In some cases, because plastic surgery was not advanced enough at the time, these masks served as a permanent cosmetic device. In total, she made 60 masks and trained others to continue her work. She was awarded the French Order of the Legion of Honor for her work. In 1936, the Ladds moved to San Diego, where Anna Ladd had a studio at the Spanish Village in Balboa Park. They continued to also maintain a home at 270 Clarendon in Boston. In 1938, Dr. Ladd applied for (and subsequently received) permission to convert 270 Clarendon into a lodging house. Anna Ladd died in June of 1939. Maynard Ladd continued to live in San Diego but also maintained a residence at 270 Clarendon until 1940. He died in March of 1942. Among the residents at 270 Clarendon from about 1939 were Francis A. Lawless and his wife, Marion (Gilmore) Lawless. They previously had lived in an apartment at 136 Beacon. On September 5, 1940, Francis and Marion Lawless purchased 270 Clarendon from Maynard Ladd. They continued to live there and operate it as a lodging house. By 1942, they also owned 204 Commonwealth which they also operated as lodging house. Francis Lawless was a clothing cutter and in the late 1940s would become president of the Lincoln Clothing Company (manufacturers of mens’ clothing). By the early 1950s, the Lawlesses had entered the restaurant business and operated the English Room at 29 Newbury. They continued to live at 270 Clarendon until about 1946, when they moved to 21 Blagdon. On April 25, 1946, 270 Clarendon was acquired from Francis and Marion Lawless by Hans Rudolph Giger, a dealer in artists’ materials and supplies. He and his wife, Helen Mae (Kidd) Giger, lived at 292 Marlborough. On November 21, 1946, 270 Clarendon was purchased from H. Rudolph Giger by Clareboro, Inc. (Charles G. Turner, treasurer). In December of 1946, it applied for (and subsequently received) permission to convert the house from “an apartment house and rooming house” into six apartments. On January 12, 1948. 270 Clarendon was acquired from Clareboro, Inc., by Mary M. Desmond, and on the same day, she conveyed the property to 270 Clarendon Street, Inc.
270 Clarendon Street, Inc., was formed by the Shubert family of New York City, best known for their theater operations. 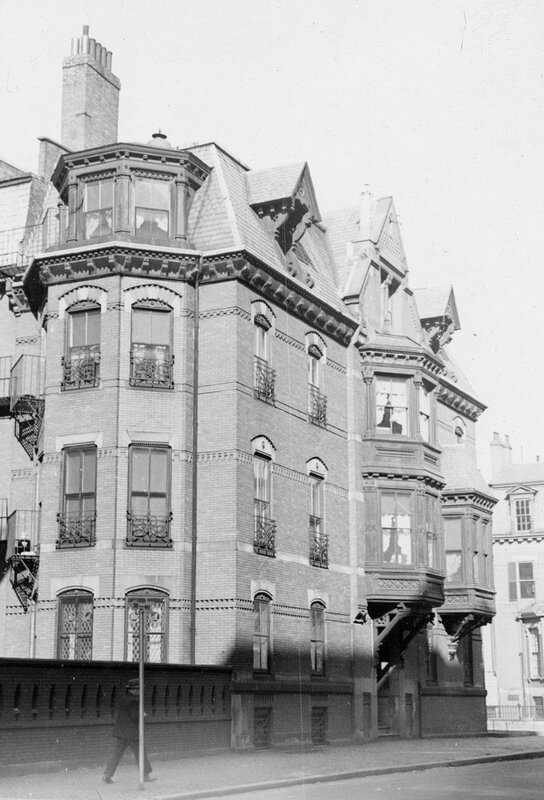 They also owned the Hotel Hamilton at 260 Clarendon. The property subsequently was transferred among entities owned by the Shuberts and on October 23, 1958, was transferred to Jacob J. Shubert. On February 24, 1961, 270 Clarendon was acquired from Jacob J. Shubert by Winsor, Incorporated. The president of Winsor, Incorporated was Florence Beth Pockwinse, a social worker and lodging house operator who lived at 31 Brimmer. On February 1, 1962, 270 Clarendon was acquired from Winsor, Incorporated, by Shepard H. Brown and his wife, Joan Brown, who lived in one of the apartments. They previously had lived in Brookline. On June 8, 1967, 270 Clarendon was acquired from the Browns by Anita R. Novins (Novinsky), a secretary in the offices of the Beacon Construction Company, owned by Robert Leventhal and Norman B. Leventhal. The Leventhals also owned 260 Clarendon and 109-111 Commonwealth, and were proposing to construct a high-rise apartment building at the northwest corner of Clarendon and Commonwealth. Beacon Construction abandoned plans for the new building in the early 1970s and on June 30, 1972, 270 Clarendon was acquired from Anita Novins by Howard N. Levin, trustee of the Cavendish Trust. In the same transaction, he also acquired 109-111 Commonwealth from the estate of Robert Leventhal, who had died in March of 1972. On January 23, 1986, 270 Clarendon was acquired from Howard Levin by Joseph M. Matzner and his wife, Dr. Alexandra M. Matzner. On June 1, 2005, 270 Clarendon was purchased the Matzners by the 270 Clarendon Street LLC, formed by Holland Development. It applied for (and subsequently received) permission to remodel the building, reducing it from six to two units, and in April of 2006 received permission to remodel the existing penthouse. On December 19, 2007, the 2700 Clarendon Street LLC converted the property into two condominium units, the 270 Clarendon Street Condominium.